Did you ever feel guilty, that you weren't giving your dog what he or she needed? Too sick, or an out of town trip, or working too many hours at the office? Our loving dogs give us so much comfort, but then something happens and we are at a loss to reciprocate this devotion. Chou Chou waits patiently for me. 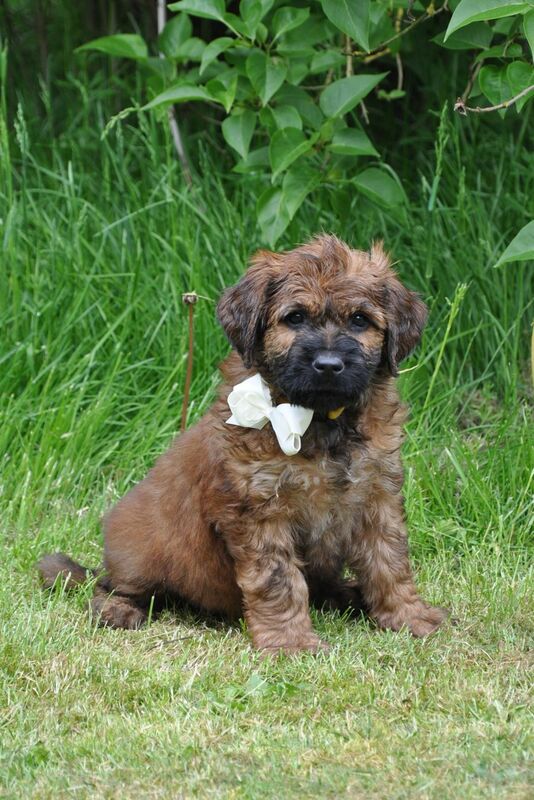 This is Chou Chou Briard at 6 weeks old. At 8 weeks, she came to live with me forever, a gift from my mom 3 years ago. They had a special bond, my mom and Chou. My mom watched her grow, heard about her adventures, and saw my photos and videos; she even nibbled my mom's birthday cake, without asking. And Chou Chou visited often, first in my mom's apartment, and then through a series of rehab nursing facilities; finally, in the hospital ICU and palliative care. Chou was at her side with me. My mom died June 30. Agility lessons were put on pause, and we did not travel to the Ventura dog show, even though Chou Chou was entered -- I had a funeral that day instead. Right after the funeral, I came down with a virus, which has lingered. With grieving and illness, I've had to stay in bed. Chou Chou walks with her dog walker, but I feel guilty that I am not walking her myself. I sleep and she waits in her bed, patiently, next to mine. She's eating later than usual, but never complains. I'm trying to keep up with brushing, but not doing very well. It's temporary. I'll get back on track. My loving pup waits at my side. I will never get over missing my mom -- kind, loving, happy, generous, sweet, and always smiling. No mother was ever better. She said that Chou Chou was the best gift she ever gave me... because she knew she had given me a friend and companion. They will always be linked, my mom and Chou Chou. I look at Chou; I remember.